The most common way to end up a hoya grower is to be given a cutting from someone. If it’s a hoya that has run in the family for ages it’s most likely a Hoya carnosa, Grandma’s old-fashioned wax plant. It’s one of the most easy hoyas to grow and it will root anyhow you do. If you have any experience at all rooting cuttings from other plants I suggest you use that method since you will most likely succeed with a method you are already used to. The cutting can be a one-node cutting like the picture to the right above. That means it only has one pair of leaves and a piece of stem. Sometimes you will get a cutting with a piece of stem sticking out on either side of the leaves and you will have to try and find out which way it will grow. 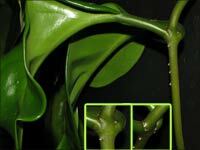 If you buy from a grower that keeps the hoyas in hanging baskets it’s very common to get cuttings with the leaves facing “the wrong way” so before you cut anything off check the picture to the left. In the big picture you see where I’ve put the #1 that points to the faint line between the stem. 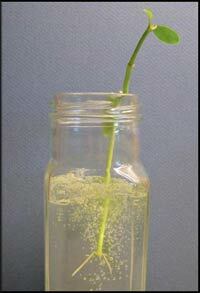 This is not always so easy to see but you can almost always see the spot from where a new stem will grow is shown, #2. 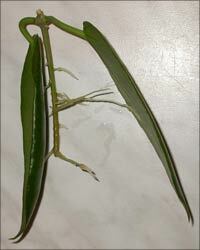 In the same picture you can also see aerial roots along the stem, note that they are more frequent just below a node, another pointer to what is up and down. When they get humid or wet they will start growing into “proper” roots. Some say that roots formed in water are a waste of time and that the cutting will have to form new soil roots when planted, but that’s a myth. Roots formed in water has had a very easy life though being able to drink as much as they want and when they get planted they will need to form a thicker skin. Before that happens they won’t tolerate being dried out so keep the soil damp (not wet!) for a while. Nowadays I usually root all hoyas in either plain water or for the very delicate ones I use swell gel, see picture to the right. 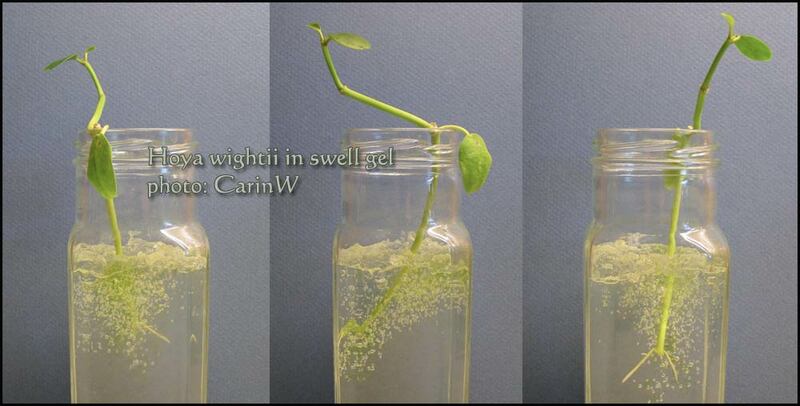 The swell gel keeps the stem damp enough to form roots but not wet enough to rot. I usually don’t change the water but simply fill up when it evaporates. Note that this will happen very quickly once the roots start forming. 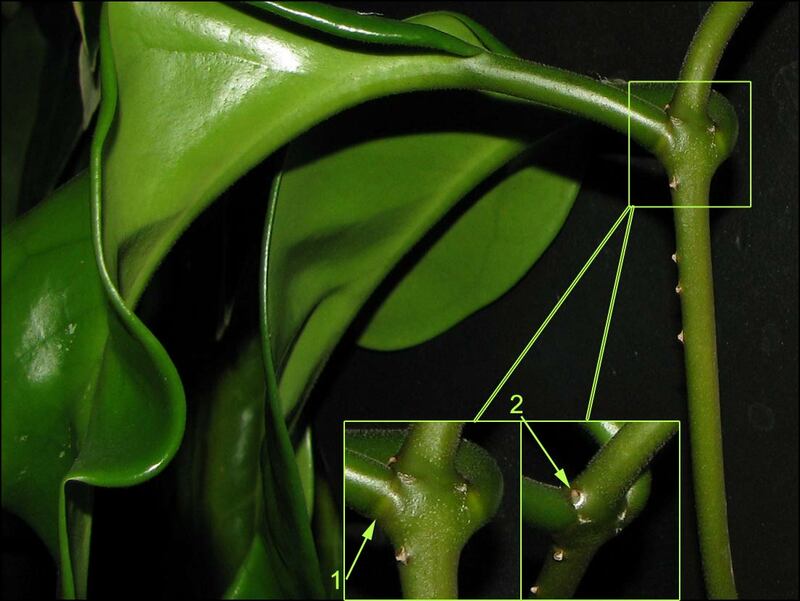 The picture at the top shows enough roots to plant but I would wait a bit longer before planting the Hoya wightii.